Yes they do exist in World of Warcraft !!!!! I find so much of this to be of pure ignorance. Some of these, so called, specialist and debunkers fail to take into consideration one grand notion. If an animal of any species can be birthed all white, it is equally plausible that it can also be birthed all black. There is no one without the other. And just because you haven't seen it doesn't mean it doesn't exist. Can there be light without darkness? No 1 extreme can exist without the other. I know this and don't even have a fancy degree from some fancy school!!!!! You don't need to tell me that you don't even have a fancy degree from some fancy school - this is only too blindingly obvious from your singular lack of knowledge re basic genetics. Comments about there being no white without black, and so forth are philosophical, but genetics isn't based on philosophy but on pure, measurable scientific principles. It is most definitely NOT true that it is equally plausible for an animal to be birthed black or white (or any other colour). Some genes are rarer within a species (and even within a given population of a species) than others - they are not all equally common. And as black lions have never been confirmed, a gene expressing uniformly black pigmentation in the lion is evidently either exceedingly rare or non-existent. Simple as that. I'm sorry, but your comments are the ones consisting of pure ignorance, not my article, which consists of sound genetic fact. Great insight into a growing number of black lion posts on FB, I sent them all a link to this blog. Thanks again. My pleasure, and thanks for the link to this blog article. Great work tracing the photos back to the originals are you a detective? lol, no, but I do try to apply similar principles of investigation and deduction when tackling cases of this nature. you know genetics have a way of doing thing you cant imagen. I would love for a black lion to come out but i might not see it. you never now. I study genetics on equine and i seen thing people say is impossible come possible if its what the lord wonts it will come to pass. You make no sense! You study "equine" LOL lady what you should be studying is GRAMMAR!!! WOW. No Black lions do not exist and they never will it is impossible. well, if it's on the internet it must be true, LOL. 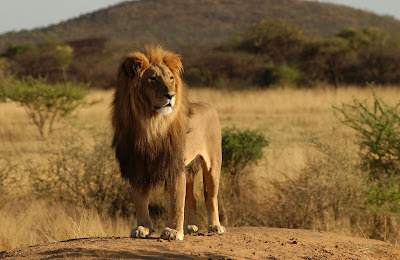 Yes, I mention George Adamson's book and black lion info from it in my 13 August 2012 update above. genetic change in a species is due to environmental changes and change in food habits... or any logical reason of evolution. If a lion were to be black, that wud be because of the need of camouflaging with the envt. so that he can hunt without being noticed. THAT my friends is possible if the earth turns completely dark for ages and only then can a Lion turn black as a whole. Otherwise what u can see and using ur reasoning try to understand is a hoax... admit OR be fooled. Man! I am disappointed. 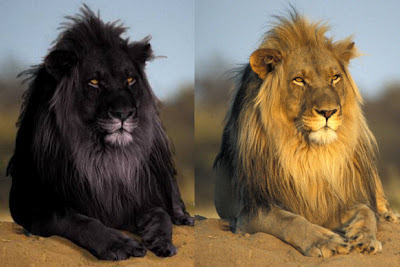 I showed the second one (PAulie-SVK creation) to my wife and she researched melanism and showed my kids all sorts of pictures of different species, including this lion. Gonna have to tell them about it. Theyre gonna be bummed. Wonderful, wonderful wordless how nature and God's creations are beautiful, God bless you for showing this is very good and instructive, loved. I have to say that the pic of the black lion is gorgeous, but I don't understand what a person gets out of posting a fake pic. I didn't believe it for a second. 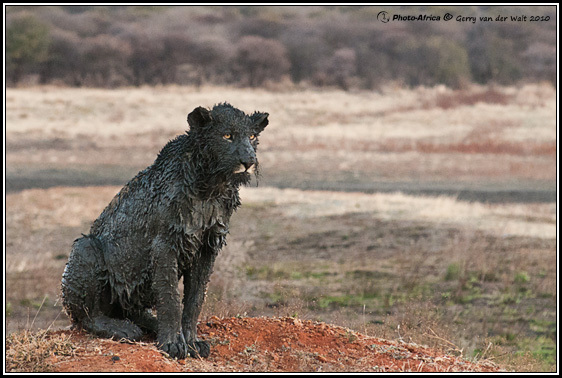 As noted in my blog post, one of the black lion photos was produced merely as an exercise in photomanipulation and was clearly identified as such by its creator, but was subsequently spread acrsos the web (without her permission) by others, who claimed it to be a photo of a genuine black lion. The other photo's creator and reason for its creation, conversely, remain unknown to me at present. I am currently reading Georg Adamsons book "My Pride and Joy". There in chapter 3 (page 54) he also write about an unproofed report about a almost black melanistic lion in Tanzania. 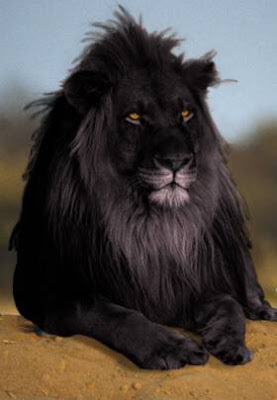 As he wrote, I think a black lion would be a awsome sight, too. But I don't think that I will ever see one in real, even if I was very surprised to read about Rodger. Great catch!If I could be a animal it would be a Lion in a world where they weren't hunted with mans weapons. I understand kill or be killed but for some of the reasons we've all heard in our past... To me they're and alway's will be King of the jungle. Whenever I see something which appears unlikely, I look into it. My research brought me here. A pity your blog isn't monetized! I wish more people would develop suspicion about photos that pop up without a photographer name or, if particularly interesting to science, no backstory. 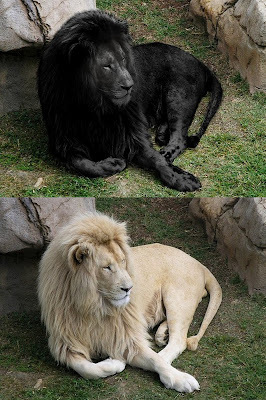 Granted, these can be faked, but something like this black lion photo is obviously dishonest, and I'm amazed at how many otherwise intelligent and sophisticated people are regularly taken in. Circulating (and helping circulate) hoaxes like this does several forms of damage. Most obviously, it's pirating. But it also causes a reduction in interest in genuine wildlife photos, hurting numerous legitimate photographers. Thanx for sharing this valuable knowledge. Possibilities? Well, it is possible to cross a male leopard with a female lion. Now, what if that leopard were a melanistic leopard? Yes, it is indeed possible to cross a male leopard with a lioness, yielding hybrid cubs that are called leopons, which has happened in various zoos, notably in a Japanese one. However, no leopard x lioness mating has ever been confirmed in the wild state. Also, a black (melanistic) leopard is so because of possessing two copies of a mutant allele (gene form) known as non-agouti that is recessive. 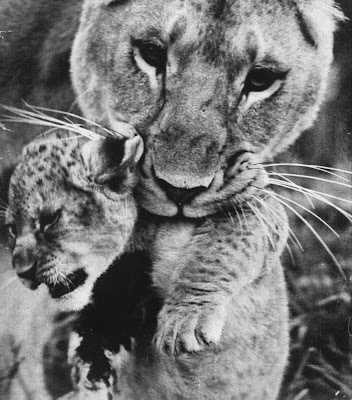 An offspring of a black leopard and normal lioness would only be black if the lioness possessed one copy of the same non-agouti mutant allele, and the cub received this from her and one of the father's copies. However, there is no evidence that the lion species possesses the non-agouti mutant allele at all. The nearest comparable case is one from a zoo in England when a black leopard mated with a tigress and produced a cub; however, it was normally coloured, not black, so clearly it had not received a non-agouti mutant allele from its tigress mother (assuming she had one, which again is very unlikely, as there are no confirmed all-black tigers on record either). But where is the proof that it's not the other way around? LOL, because firstly: I've given the sources of the normal lion pictures, all of which existed long before the black ones. And secondly: if these black lions were real, especially the captive ones, they would be among the most famous animals on the planet, with queues around the block waiting to get in to see them! You don't have an animal as exotic and extraordinary on display as a black lion and not promote it!! I am impressed by your post. But I am much more impressed by the way you have so calmly replied all the queries and obligations over your post. Hats Off to you myan. You are just AMAZING. Thanks very much! Glad you enjoyed my post. A valuable post. But what if the black lion actually exist? Thanks. Although there are as yet only unconfirmed reports (as documented here in this post of mine), it would not be impossible for one or more black lions to occur if the necessary mutant allele spontaneously occurred. However, what my post is primarily concerned with is that the purported photos of black lions examined here are fakes, not photos of genuine black lions. Really enjoyed your forensic post! Not a black lion story but my father spoke of finding himself in the middle of pride of black maned lions at night. The male was enormous. Somewhere near Kabwe, Zambia in the late 1940's/early 1950's. I don't think that a black lion would survive in the wild. It most likely would be killed by members of its own pride. Wild predators do not usually tolerate abnormalities in their midst. It would make it harder for them to hunt and track prey. I totallly agree, this sort of thing has happened with other species,animal racism almost theres a thought,if u know what I mean? A very interesting post. Today only I saw this second picture of black lion on Facebook. Though it looked beautiful, I had a doubt 'cause I had never heard about any black lion! 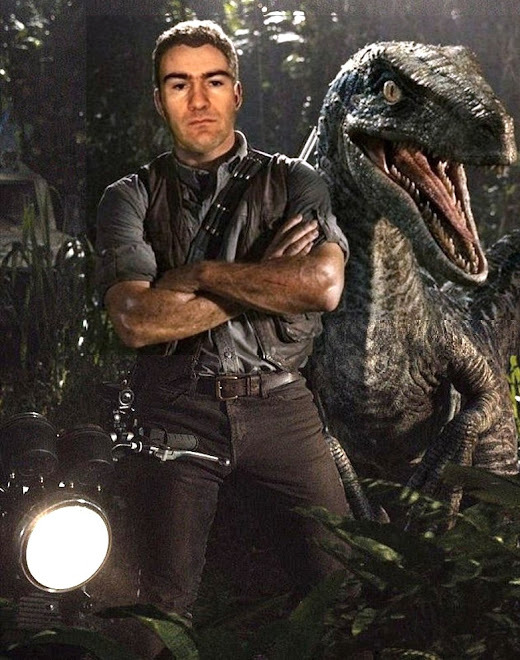 So I Googled, got here and found out it is actually photoshopped! Black lions in the wild wouldn't stand a chance due to their lack of camouflage. They would starve to death. 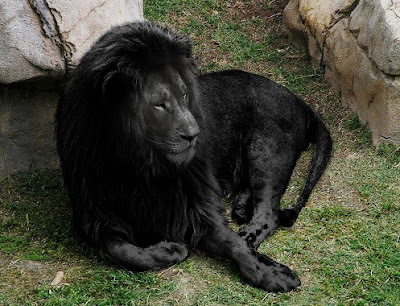 BLACK LIONS CERTAINLY EXIST!!!! NO I AM NO FOOL.. IT IS JUST AS THE BLACK SUN EXISTS. OUR SUN. WHEN WILL THE HEAVENLY CREATOR REVEAL BLACK LIONS AND THE BLACK SUN AGAIN; THIS IS THE QUESTION? so are all Melsanistic animals fake? they cant be... its just like albinoism, right? No, not all melanistic animals are fake. On the contrary, there are numerous fully-confirmed examples of melanistic animals on record, such as melanistic leopards (aka black panthers), melanistic birds of many different species, squirrels, zebras, deer, antelopes, snakes (e.g. black adders), lizards, fishes, insects (such as the famous carbonaria version of the peppered moth), etc. They are simply individuals possessing more than the normal amount of melanin for their respective species (just as albinos are individuals possessing less than the normal amount of melanin for their respective species). As yet, however, no confirmed specimens of melanistic lions have been discovered. That is not to say that no such lions could ever occur, it's just that none has been discovered so far. It is only those photos of so-called black lions examined here that have been shown to be fake. Hi,im from Tanzania,,they are precious creatures...when i was about 5 years old my dad ,a noble farmer took us to close to a river to see him..there it was ,,a full colour black giant lion,,it was bigger than the normal lion also. There is bad menkind taking nature pre iousness and selling it to annonimous rich entities for millions of dollars,,of course they dont want the people to know,,but i grew up in Tanzania,,and i am a witness..they are real. I'd be interested in seeing your Dad's picture of the black lion. Thank you for setting things straight. It was disappointing to learn this truth but I prefer it to deceit and/or misconceptions. 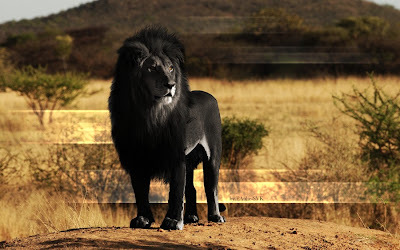 I have a simpler program than Photoshop, and all that I need to do in order to convert a normal animal in a photograph or drawing into a melanistic one is simply draw around its outer edge on screen to select it for conversion, then turn the brightness setting down until the required level of melanism is achieved.